RNC anti-war protests:	Saint Paul city council rejects appeal, permit fight continues | Fight Back! 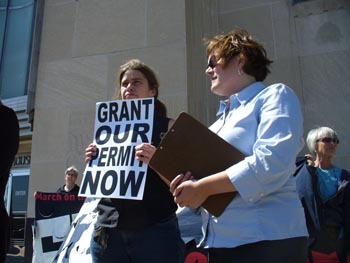 St. Paul, MN - Organizers of the massive anti-war march scheduled for Sept. 1, the opening day of the Republican National Convention, slammed the Saint Paul city council for turning down the permit appeal, May 21. By a six to one vote, the Council voted to uphold the unworkable permit that was issued for the protest on May 15. “The permit issued by the city May 15 does not allow for the massive anti-war march that we are organizing for Sept. 1. People are coming from all over the country to protest the war on Iraq. Tens of thousands are expected to march on the Xcel Center. The permit issued by the city does not allow for that in practice,” said Meredith Aby of the Coalition to March on the RNC and Stop the War. In testimony before the city council, Aby talked about the problems with the permit. She noted that the start and end times will not allow for many of the demonstrators to make it from the starting point at the Minnesota state capitol building to the Xcel Center. She also noted that the limited turnaround area at the Xcel Center and the expectation that demonstrators would march back on the same route that they came were unworkable. Bruce Nestor of the National Lawyers Guild told the council that the permit did not meet the constitutional requirements for allowing free speech. Statements criticizing the city’s permit - from Leslie Cagen, of United for Peace with Justice and Sara Flounders, of the Troops Out Now Coalition - were distributed to council members. In a press conference before the city council meeting began, Deb Konechne of the Coalition to March on the RNC and Stop the War stated that politicians who were interfering with the planned anti-war march were in fact complicit with the war in Iraq. Organizers of the Coalition to March on the RNC and Stop the War will continue the fight for permits that allow for a visible, mass protest as RNC opens Sept. 1.